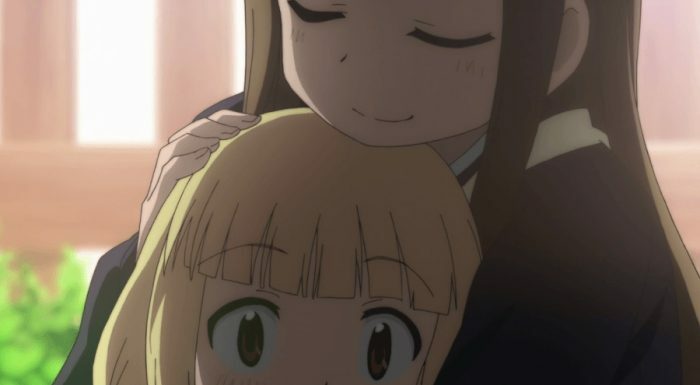 See now, that was just a very heartwarming episode, but it has been kind of surprising (and even a little frustrating) to see a fair number of contemporary viewers reacting to episode 02 of Alice to Zouroku with phrases like “Oh no – not another cute girls doing cute things show with loli shenanigans”. Gah! Talk about completely and totally missing the point! First and foremost one of the main themes in the series centers around the main characters slowly growing and changing through their interaction with one another. And it seems really clear that for Sana it is not only the tough old man Zouroku who will have a hand in this, it is also Zouroku’s granddaughter Sanae (who shows up for the first time in this episode) who will be influential. 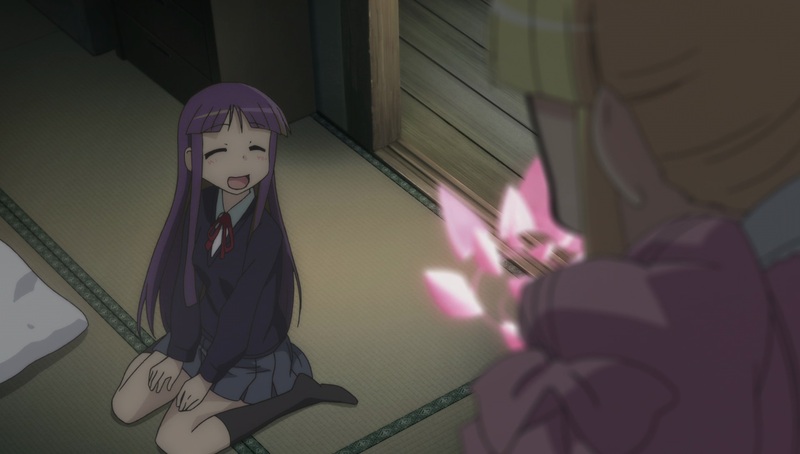 Sanae is an incredibly gentle and rather responsible girl who is extremely able to adjust to circumstances around her, and apparently it runs in the family – as apparent from Zouroku’s reactions to Sana’s powers in the first episode as well. 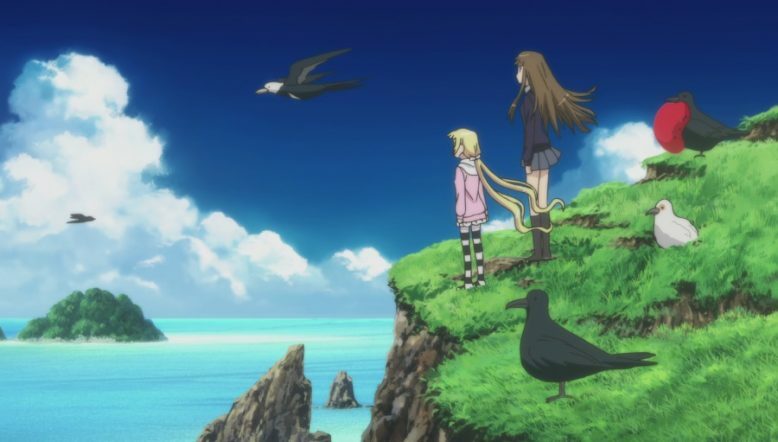 While they are not unflappable (Sanae lets out a very understandable scream when she suddenly finds herself teleported high in the air above the city and plummeting to the ground, for example) they are remarkably cool-headed and composed; from penguins in Antarcitca to utterly remote grassy rock islands riddled with birds in the middle of the ocean (somewhere near the Orkneys, maybe?) Sanae reacts with equanimity and delight at the natural wonders around her. The content of the episode primarily focuses around Sana warming up to Sanae, who is asked by Zouroku to look after the newly arrived kiddo. Sana’s initial reactions to Sanae are understandably laced with distrust, but after a bit of interaction and a little food – Sanae makes some pancakes for Sana, something she apparently never had eaten before then – Sana warms up, and in their conversations we get glimpses into the world Sana grew up in. Bleak does not begin to cover it – it was heartbreaking to see how … desolate of an inner landscape Sana had, how devoid of a sense of personality or identity for a time despite wielding such incredible magic abilities. Sanae herself seems to have lost her mother (there are hints of this early in the episode as the “camera” swings to an old photo of a young woman with long hair that is happy and smiling in a photograph) and perhaps the pain and suffering she went through (or still experiences to a degree?) has helped make her into the gentle creature she is – she is not really presented as an “intellectual or “sharp minded” type of person like Zouroku seems to be. Rather she seems to be a walking body of empathy, and showers the unexpecting and disarmed Sana with it, who responds well at root, but really does not quite know how to process it. But she is grateful – so, she takes Sanae to beautiful places … all over the world, instantly, via teleportation. Whoa. In essence what we are seeing here is the beginnings of Sana being “humanized” by normal human interaction and kindness, which is probably what Zouroku had in mind in part in sending Sanae there to begin with. 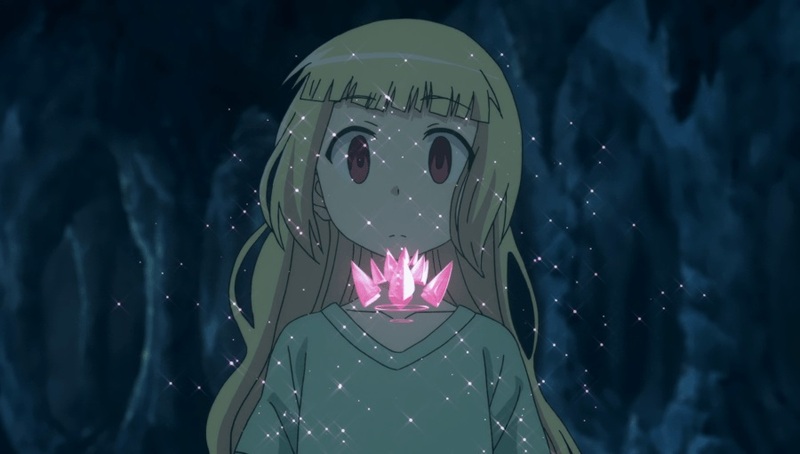 (One recalls similarities in some of the earlier episodes of the Usagi Drop anime, where Rin slowly opens up bit by bit after being around Daisuke.) But even with the first seeds planted in Sana’s experiences, she still is quite a handful who seems largely clueless about either “society’s norms” or “common sense”, things Zouroku values highly and has pondered long and hard over. 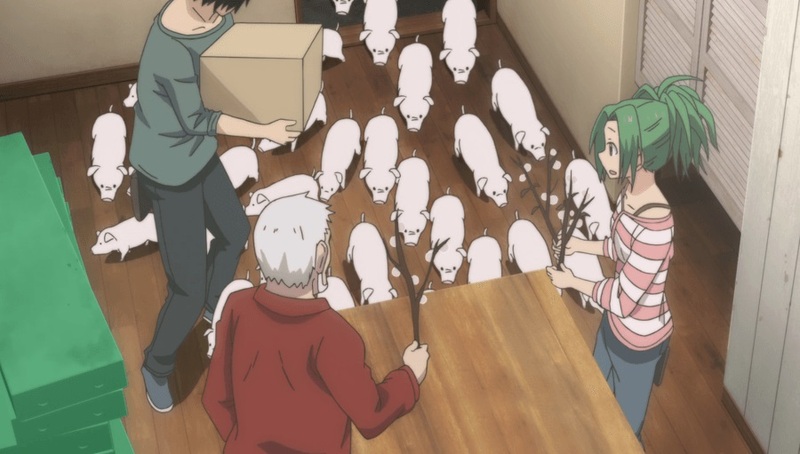 Teleporting the herd of piglets into Zouroku’s flower shop unsurprisingly brought down his curt response on the poor confused and embarrassed Sana.